Steve’s breakdown: BARK is going public and this 30-second clip shows you what they are doing with advertising. Clearly, they will step it up a few notches and possibly hire an agency. Jay Livingston is the CMO. NEW YORK, NY: For dog parents, the hottest stocking stuffer this year won’t be a Nintendo Switch. Instead, it’s a holiday-themed assortment of glistening doggy treats and indestructible chew toys. BARK, the parent company of BarkBox, is feeding on dog lovers’ inability to resist spoiling their pets. Customers pay about $20 to $29 per month and receive a themed curation of pet goodies. Launched in 2011 by Matt Meeker, Henrik Werdelin, and Carly Strife, the idea stemmed from Meeker’s frustration with not being able to find products tailored to his 130-pound Great Dane. Werdelin says BARK is sniffing around $150 million in sales this year, making it the most dominant player in the dog subscription space. 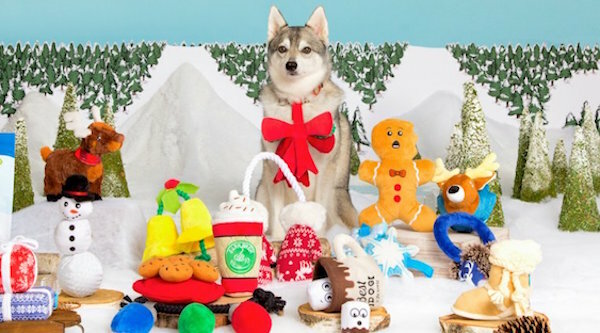 This Christmas selling season, BarkBox’s monthly theme is “Dogsmas in the City,” with boxes that might include clever treats like “Seven Snacks A-Quacking” duck, bacon, and apple chews, or “Norm the Nutcracker,” a plush with extra stuffing. Customers can also purchase individual items from the holiday line, “A Winter’s Tail,” at Target stores or online. BarkShop, its e-commerce store, expands the BarkBox assortment to larger and pricier goods such as $120 dog party sets or donut-shaped dog beds for $100 to $180. This season also marks the debut of BarkBox’s first major holiday-themed TV ad and direct mail campaign. The 30-second clip opens on a snowy evening, with a doe-eyed dog staring wistfully into a window display of BarkBox toys. The company is using traditional advertising to get beyond its current 500,000 subscribers and reach a population of dog lovers who aren’t necessarily scrolling Facebook and Instagram–baby boomers. BARK barely has to lift a paw to engage its online community. “Influencers reach out to us all the time with content submissions,” says Chief Marketing Officer Jay Livingston, adding that BARK currently has about 500 dogs on payroll. And it’s working. The brand claims about six million current followers across its social media accounts, where much of the content is humor-driven and user-generated. On Facebook, an adorable video of cuddling pit bulls racked up 31 million views and 622,000 shares. The ideas are so good, Livingston jokes, that it makes his job difficult: “For me to develop that kind of content is almost impossible.” Country star Blake Shelton, for instance, reached out ahead of his album launch. “We sold him 500 boxes, which he later resold with his album as a bundle,” says Werdelin. “On Halloween, our team dressed up as Weiner dogs and hid for a scavenger hunt in New York.” Shelton serenaded the first five winners with a lyric from his new single (appropriately titled “I’ll Name the Dogs”). “We’re one of the biggest product startups in New York. We shipped 50 million products since launching,” says Werdelin. “We want to be the Disney for dogs.” He likens the future of BARK to companies like Google and Apple, where events, content, and services are designed to make consumers happy–and their lives easier. Existing business models include BarkPost, a blog about dogs, and BarkLive, a platform for community-hosted events. BarkJet is a working project catered to owners who want fly with their dogs without the annoying airline policies.